grandma's cookie jar: crafting with grandma - Fun, Excellent & Inexpensive Gifts - Puzzle Snowmen! crafting with grandma - Fun, Excellent & Inexpensive Gifts - Puzzle Snowmen! Do you enjoy putting puzzles together? What do you do with a puzzle when you after you put it together? Do you save it and then put it together another time or does it get put in the closet never to see the light of day again? If you have a closet with puzzles in it which you are not sure what to do with, consider turning them into great gifts for people on your gift list this year - and I'm not talking about just re-gifting them! This would also make a great project for you to use if you are looking for something your grandchildren could make and give as a gift to their parents or even sell and use the money to help a family in need or buy something like bunnies from WorldHelp's Gifts of Hope catalog . . . I love providing bunnies for families in need around the world! I LOVE to celebrate Christmas with my family, but more than the fun of Christmas I want my grandsons to know about the most important Gift they will ever receive - Jesus! I want them to grow to be men who share this Gift with others. And, they do not have to wait to be adults to do this! They can give as children so others in need are able to learn about the love of God and how Jesus is the Best Gift they'll ever receive! 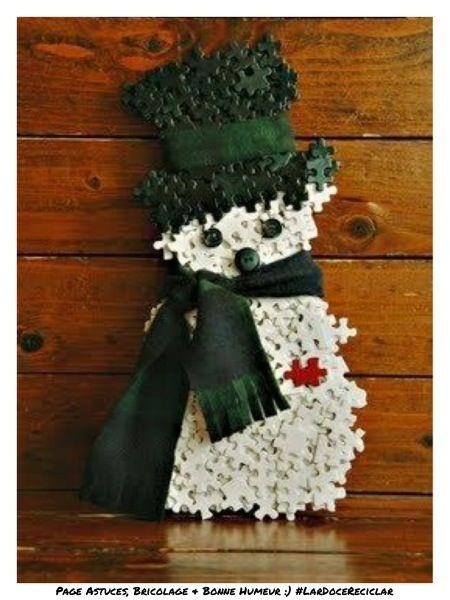 Making and selling puzzle snowmen is just one way they could do this! So, what do you think about these puzzle snowmen?